Two species of fire ants are found in Florida. 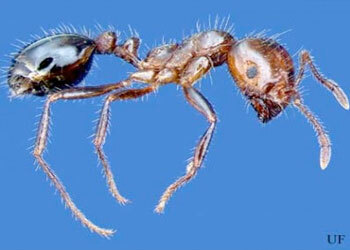 Most notorious is the red imported fire ant (RIFA), followed by the much less common tropical or native fire ant. The sting of the RIFA possesses venom of an alkaloid nature. Approximately 95% of the venom is composed of these alkaloids, which are responsible for both the pain and white pustule that appears approximately one day after the sting occurs. In urban settings, the RIFA may nest under patio slabs, in lawns, under edges of sidewalks, foundations, concrete driveways, and electrical boxes. After a heavy rain, the colony may move to higher ground or inside homes to take refuge from saturated soil. If nesting under patio slabs or concrete walkways, the nest cavity may cause the concrete slab to fall and cause damage to the sidewalk.